03.01.12	Who Wore It Better? Rachel Bilson was the first to wear this Vanessa Bruno jacquard metallic jacket when she celebrated her NYLON November cover at a swanky party held at Sherbourne in LA mid November. The ‘Hart of Dixie’ actress wore a black The Row Sabeen T-shirt and GoldSign Jenny high rise slim leg jeans with her jacket. A black hat, a tan oversized Miu Miu clutch and Christian Louboutin ‘Pigalle’ heels completed her look. Rosie Huntington-Whiteley wore the same jacket late last month whilst grabbing a bite to eat from In-N-Out Burger with boyf Jason Statham. She opted for lighter-coloured MiH denim jeans and a cream top. A mini Celine bag and tan booties completed her look. Rachel was no doubt styled to the very last detail. I wish that detail didn’t include the clutch. Rosie’s just-thrown-on look is much more appealing so she wins for me. 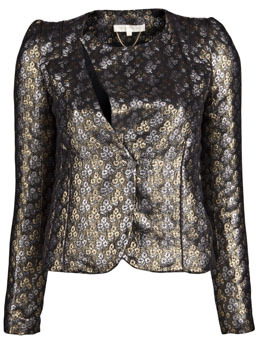 You can buy Rachel and Rosie’s Vanessa Bruno jacquard jacket from farfetch.com. Posted by Catherine Kallon on January 3, 2012 In: Rachel Bilson, Rosie Huntington-Whiteley, Vanessa Bruno, Who Wore It Better?